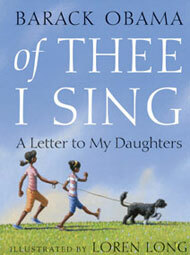 A picture book titled “Of Thee I Sing: A Letter to My Daughters,” will add Barrack Obama's list of books that he has authored. The US President wrote the book as a tribute to 13 groundbreaking Americans, from the first president, George Washington, to baseball great Jackie Robinson to artist Georgia O'Keeffe. Obama wrote the book before he took his position in January 2009. The book will be published by Random House Children’s Books on Nov. 16, two weeks after the midterm elections. Obama's book is illustrated by Loren Long, whose many credits include Watty Piper's classic The Little Engine That Could, Randall de Seve's Toy Boat and Madonna's Mr. Peabodys Apples. Long wrote and illustrated the children's stories Otis and Drummer Boy. The cover features an illustration of Mr. Obama’s daughters, Malia and Sasha, as they stroll across a grassy lawn with the family dog, Bo, walking in front of them. Obama's 40-page book will have a first printing of 500,000 copies and a list price of US$17.99. Both of Obama's previous works, The memoir Dreams From My Father and The policy book The Audacity of Hope, are published by Crown, a division of Random House Inc. Obama has written at least 5 books before this and had already become an internationally best-selling author.